Ruby's records show that prior to her transfer to Los Angeles Zoo, she was transferred several times and performed with Circus Vargas. The trauma from capture and transfer is devastating to a young elephant. Obviously, Ruby's life was the ultimate cause of her death. 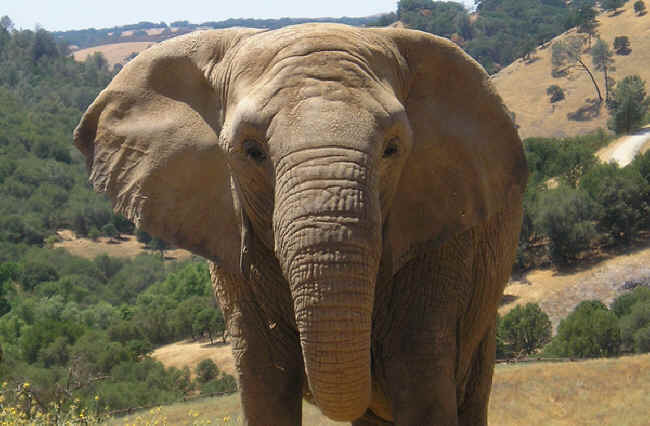 On May 15, 2007, the Los Angeles Zoo delivered Ruby, a 46-year-old African elephant, to ARK 2000, PAWS' 2,300-acre sanctuary in San Andreas, California, to live in retirement with 71, Mara and Lulu, PAWS three African elephants. Within days, Ruby had socialized with the other elephants and became an important member of the group, roaming the hills and foraging on the grassy slopes with her new friends. Ruby became the respected and beloved matriarch of the group over the next few years, and was often seen on top of the hill, ears flared, guarding her companions with the fierce determination of a wild elephant matriarch. Everyone who worked with Ruby was mesmerized by her beautiful eyes and her gentle disposition. She will be missed by elephants, caregivers and her many fans who were privileged to share her life. At 50 years of age, Ruby was one of the oldest African elephants in captivity. Ruby died at 6 p.m. on March 29th, 2011. Ruby's veterinarian, Dr. Jackie Gai, PAWS director, Pat Derby, and the entire elephant staff were with her when she passed. A necropsy is being performed at UC Davis, and results are still pending. The loss of this magnificent individual is a direct result of captivity and its traumatizing effect on elephants. We must stop the senseless capture and export of wild elephants and keep elephants in the wild.